Altstadt Lübeck is a UNESCO World Cultural Heritage-listed site famous for the finest brick-Gothic architecture in Germany. 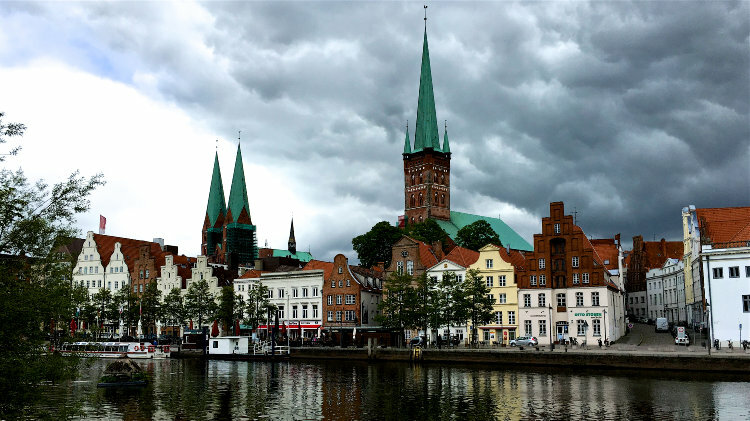 However, Lübeck has many sights in addition to the Marienkirche, Rathaus, Holstentor, and Buddenbrookhaus. 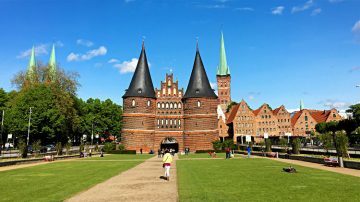 The top sightseeing sites in Lübeck in Northern Germany’s Baltic Coast are the Holstentor, brick-Gothic Rathaus and Marienkirche, Café Niederegger, as well as the Buddenbrookhaus and Hanse Museum. However, there are many other sights worth seeing too. 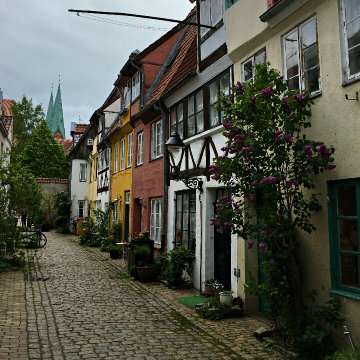 The narrow, medieval alleys of Lübeck’s island-based old town are literally littered with brick-Gothic marvels. The top sights are in the central parts of the old town but it is well worth strolling further in to this lovely old town for even more brick Gothic. Lübeck can also be written Luebeck – Lubeck is understood easily enough but spelt (and pronounced) wrong. The Holsten Tor (Holsten Gate) is the symbol of Lübeck. This mighty town gate was built to impress during the 15th century when such town walls had a lesser defensive purpose but rather had to impress on visitors the might of Lübeck. Lübeck was at this stage at the peak of its power and the third largest city in Germany. The Holstentor is located between the main train station and the old town of Lübeck so often the first of the brick Gothic buildings visitors to Lübeck see. Soe of the finest panorama views of Lübeck is from a bit to the south of the gate. 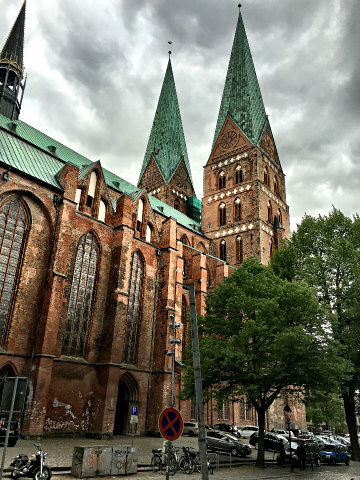 The top sight in Lübeck is arguably the most-impressive brick building in the world – the Marienkirche (Mary’s Church). 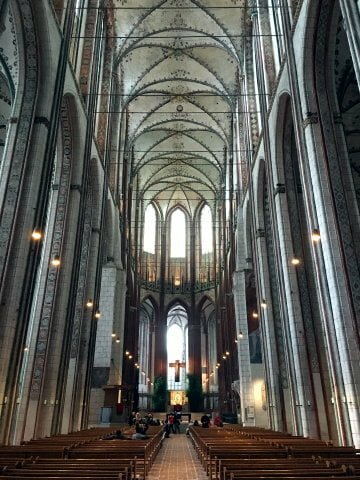 This large 13th-century church served as the inspiration and prototype for around 70 brick Gothic churches that were build during the Middle Ages in Northern Germany and other Baltic Sea states. Although the interior of the Marienkirche burnt out after the air raids of 1942, most of the structure is original. Two bells at the back of the church lies where left where they had fallen to warn of the destructive power of war. The twin spires of the Marienkirche are 125 m high while the nave is at 38.5 m the highest brick nave in the world. The church is the third largest in Germany. 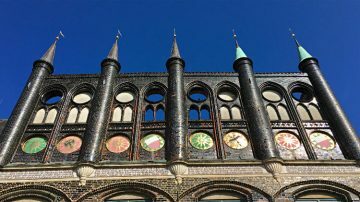 The Rathaus (Town Hall) of Lübeck shows building styles from the 12th to mid-20th century. However, it is the brick Gothic that impresses most, especially from the Markt (market area) where the shields confirm that Lübeck was once a Free Imperial City. On the Breite Straße side, the 16th-century Dutch Renaissance staircase is the more impressive feature. Times for tours of the interior is posted here. Niederegger has some tables in the arcades but the main Café Niederegger with its marzipan museum is just across the road. In addition to the Buddenbrookshaus and European Hanse Museum, several brick Gothic buildings make it worth strolling through the northern parts of the old town of Lübeck. The Schiffergesellschaft (Seamen’s Guild) is one of the most popular restaurants in Lübeck. It is at the far northern end of the Altstadt island in a building with a 1535 Renaissance brick facade. This tavern has a rough wooden interior with brass fittings as befits a former seamen’s guild hall. Lunch hour is a good time to arrive, preferably armed with reservations (tel 0451-76-776). Across the road is the 14th-century brick-Gothic Jakobikirche. 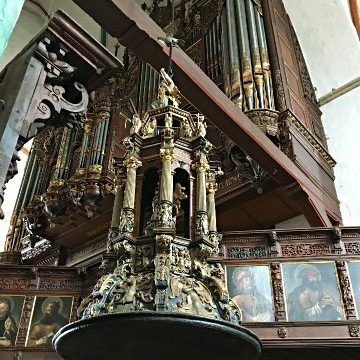 With so much competition in Lübeck on the brick-Gothic front, the main attraction in the Jakobikirche is not the architecture but rather the splendidly carved 16th-century organ lofts. Nearby is one of the oldest social institutions in Europe, the 13th-century brick-Gothic Heiligen-Geist Hospital (Holy Ghost Hospice). It has an impressive Gothic hall and large 14th-century wall paintings. A long block down Königstraße is the Museumskirche St Katherinen (Museum Church St Catherine’s). The interior of this 14th-century brick-Gothic church is now used as an art museum filled with modern sculptures. Down Glockengießerstraße are several Höfe und Gänge (Courtyards and Passages) – social housing erected by wealthy Lübecker during the 17th century for the poor and elderly. At No 21 is the Günther Grass Haus – a museum dedicated to the drawings, paintings, and sculptures of Günther Grass, generally more famous for his writing. Born in Danzig, Grass had to fled his home town after the Second World War and spent many years in Lübeck. His best-known work, Die Blechtrommel (The Tin Drum), published in 1959, tells the story of a a boy and later man who had to leave Danzig after the war. Grass was awarded the Nobel price for literature in 1999. He was severely criticized for waiting until 2006 to acknowledged that he was a member of the Waffen SS during the Second World War. The sights in the southern part of the Lübecker Altstadt draw generally see fewer visitors than the center and northern parts of town.However, the churches here are very much worth seeing too. The brick-Gothic Dom (Cathedral) is the oldest building in Lübeck. Its core is 12th-century Romanesque but this is well hidden by the 14th-century brick-Gothic makeover. The artistic highlights are the 13th-century Paradise Portal and a Late Gothic crucifix. The cathedral was severely damaged in 1942 and much of its structure is thus concrete built to resemble the medieval original. Although longer than the Marienkirche, the cathedral is lower and narrower than the brick Gothic Marienkirche in the center of the Old Town. Nearby, in a former monastery, is the St Annen Museum. It houses religious art from the Middle Ages to the present with the works from the 15th and 16th centuries particularly impressive. Also worth seeing is the Aegideinkirche (St Gilles) with an interesting interior. Closer to the Rathaus and Holstentor is the Petrikirche. The original Romanesque basilica received a Gothic makeover and two additional naves during the 14th century. The Petrikirche was virtually destroyed during the Second World War but reconstructed and most conveniently, an elevator was added to hoist visitors up to the best viewing platform in Lübeck. Flying directly to Lübeck is rarely an option. Although the Lübeck-Blankensee Flughafen (LBC Airport), just south of town, is very conveniently located, it currently has not scheduled commercial flights. Most passengers have to travel via Hamburg Airport. Deutsche Bahn trains generally provide the fastest and most convenient transportation to Lübeck. However, Flixbus long-distance buses can often compete on time and price on the Berlin to Lübeck route with the occasional bus services to Kiel and Copenhagen also good options. Lübeck’s train station is a few minutes walk to the west of the old town center. Hamburg can be reach in40 minutes from Lübeck Hauptbahnhof by at least hourly direct trains. Hourly trains to Kiel take just over an hour. See timetables and buy tickets from German Railways. 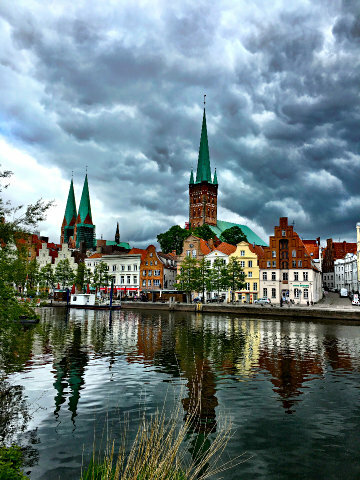 From Berlin, Flixbus coaches take around four hours to Lübeck. Trains from Berlin to Lübeck are frequent but require transfers and are only marginally faster than the bus (and usually more expensive). Flixbus buses are also available to Kiel and Copenhagen in Denmark.